If you’re a goal-oriented individual that wants to climb the corporate ladder, a career as a managing director may be for you. 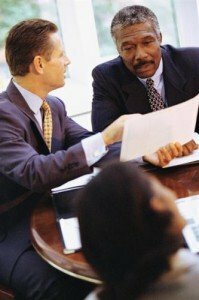 Managing directors are also known as business managers, general managers, operations managers and even financial managers. The title of managing director can apply to a variety of occupations which have very similar features. Managing directors are usually individuals that are responsible for the operations of either a single company or multiple companies. Managing directors are usually found in large corporations or chains. Occasionally, the title of managing director may be used in reference to the chief executive officer of the company. The responsibilities and benefits of being a managing director will vary depending on the company that is being managed. If the managing director is simply the general manager or operations manager of a company they will usually be responsible for the financial and logistical operations of the company. If the managing director is the CEO of a financial or wealth management company they may have additional responsibilities, especially in relation to the company’s investors and shareholders. A managing director will usually need to organize the company’s finances, personnel and other core assets. Overall, the managing director’s job is to make the company profitable and to keep it that way. Managing directors are usually responsible for virtually everything the company does, which includes the overall revenue generation of the company, the marketing of the company and the eventual goals of the company. The managing director will usually need to create reports and presentations for the shareholders and investors within the company. Managing directors will usually spend a significant amount of time going through the reports from the company and analyzing them. They may need to determine why sales goals aren’t being met or why customer focus has shifted. Overall, the managing director’s job is to make the company profitable and to keep it that way. This can entail many tactics, including creative budgeting techniques. Managing directors will also need to advise the company owner or board on changes to income and expenses on a regular basis. How Do You Become a Managing Director? Managing directors usually have at least a decade of experience within the industry and they often have prior experience within the company itself. A managing director needs to be very familiar with business management strategies as well as the company they are working for. Most managing directors will have a business management Bachelor’s Degree or even a Master’s Degree to progress into the position. General managers will usually become managing directors, and the career path generally begins by becoming an assistant director, regional director or department head. The specific path to promotion will often vary based on the company itself and its corporate culture and policies. It may take many years to become a managing director but managing directors are highly paid and highly respected individuals. According to the Bureau of Labor Statistics, the most profitable positions are with the financial market and the transportation market. How Do You Advance as a Managing Director? Advancing as a managing director usually entails becoming the director of progressively larger or more profitable companies or by gaining shares within the company that the director is managing. In terms of actual positions, there are few positions elevated above that of a CEO for a large corporation. Managing directors may obtain higher degrees and may network to acquire opportunities in either larger companies or companies that have more room for growth. Overall, however, there are very few things that someone who has been a managing director in the past cannot obtain. Those interested in entering into related fields may consider entering into specific industries that are considered more lucrative, such as the area of financial and wealth management. According to O*Net Online, many managing directors may become self-employed consultants.